It’s about four-thirty on an ordinary work day afternoon. I sit down at a computer terminal on a desk of an office worker. It’s not my desk, but it’s the closest unoccupied computer terminal. I need to check something in the system. The system is already logged on by a user so there’s no need for me to log in. Within seconds a message pops up alerting this particular user of a new inter-office message. I hit return to get rid of the pop up message because that’s my habit. Of course, I’m almost always on my own log in, but not now. When I hit return it opens the message. Right away I’m conflicted wishing I hadn’t seen it, but glad I did. It’s a sexually explicit message between co-workers. I don’t know they’re even dating, much less involved in some inter-office romance that has crept into our professional environment. It’s graphic. I’m certain I blushed. And I’m sitting at this desk alone. Knowing what I have to do. Within 30 minutes I’ve got a person sitting in front of me, alone in my office. I’ve printed out the message. And a few more just like it from an earlier date…all from the terminal I was sitting at. I know who the recipient of the message was and who the sender was because every employee has their own unique login (user name and password). In front of me sits the sender. I hand over the printed copies without saying a word. The sender’s head drops. Profuse apologies follow. I purposefully allow the tension to build and hang in the air. I know it’s a terribly embarrassing circumstance. For both of us. I embrace it knowing that I have to correct this behavior, but also knowing that this person is a very good employee. I’ve no intention of terminating this person. Or the recipient, another high performing employee. But nobody knows this except me. Not yet anyway. I express my disappointment and disapproval. I want this person to feel ashamed. It’s working. I resist the urge to make this easy on either of us. It’s a serious infraction and I need to embrace the gravity of the situation so they will. Within 15 minutes it’s over. I’m convinced it will not happen again. Ever. And like a compassionate leader should, I also embrace the notion that I will never speak of this again. I don’t. I forget about it and move on, refusing to allow it to dampen my enthusiasm for two employees who have a proven track record of high performance. I sit alone in my office after it’s over and lean back in my chair. Big exhale. Relief that it’s over, but I know this “couple” is going to be fretting about it for a good long while. Their embarrassment will likely be felt forever. I’m happy about that. That’s how it should be. But I’m also thankful that I sat down at that terminal. It gave me the opportunity to serve these employees. And to be discreet about it. What if it had been somebody else who had seen that message. My hand might have been forced to get rid of these employees. Sometimes it’s a very thin line that separates good fortune from bad. Sitting down and having that talk was important. Being candid…well, there just wasn’t any other option. This wasn’t the time to mealy mouth around. It was time for honest conversation. Leadership always comes back around to being honest and candid. The other day as I sat with a fairly young leader discussing a variety of challenges, I mentioned a story – and old book – that I knew was well before her time, The Abilene Paradox and other Meditations On Management by Jerry B. Harvey. 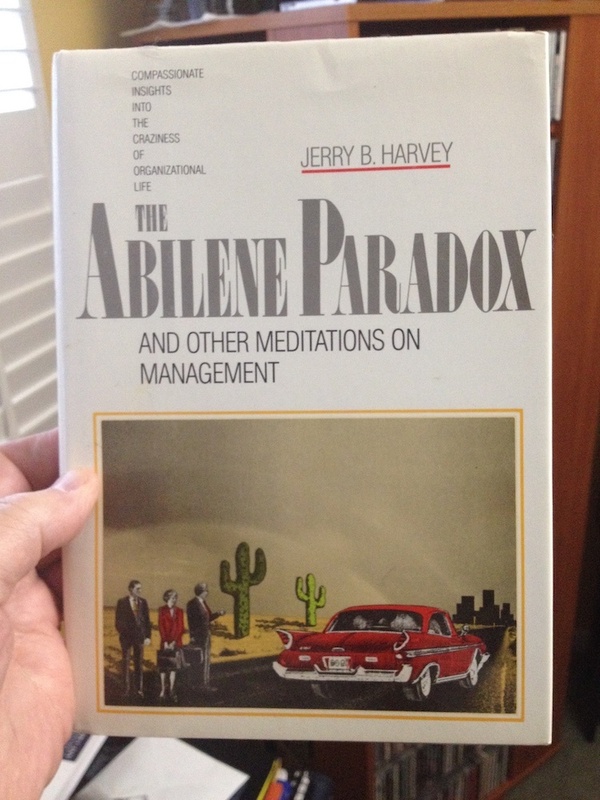 The copyright is 1988, but Mr. Harvey first published his Abilene paradox story back in the mid-70’s. You can click here to download a free PDF of the Abilene paradox (not the entire book). The story powerfully, but simply illustrates the breakdown in group communications. There are lots of things going on here. There’s fear of being the odd man out. There’s fear of saying what you really think, or feel. There’s fear of contradicting the person with the idea. There’s reluctance to speak out. Blah, blah, blah. Every issue boils down to fear of being honest and candid. Management brainiacs have long studied group dynamics and “group think.” Honestly, I don’t care about that crap. I care about somebody whose willing to serve. A real leader! But there is something very powerful in the story because it clearly addresses something business people have probably all experienced — timid group behavior where people may likely be thinking the same thing, but nobody says anything. Have you ever broached a subject at work, wondering if you’re the only person holding a specific opinion, only to find out that everybody felt just like you. Hello, Abilene Paradox! At other times you may have broached the topic and many people were in lock step with you, but there’s that one (maybe more) person who has a contrary opinion. Suddenly, a few of the courageous start to waffle, leaning more toward the contrarian. It’s usually because the contrarian is normally a more highly charged personality than the more compliant folks. That can intimidate some. It can change the psychology of the entire room leave you wondering how the waffler really feels. The Abilene Paradox demonstrates how group-think can be innocently impacted by acquiesce and indifference. But it can also be impacted by one rebel rouser. Maybe you’ve seen it. One loud-mouthed bully can mount some podium topic and drive the room wherever he wants because most people will crawl inside a shell, especially if the bully has a title. I’m interested in group dynamics like that and I always catch myself looking away from the opinionated loud mouth, watching the others. Some shift in their chairs, visibly uncomfortable, but refusing to speak. Others look straight ahead, stoic. Still others doodle with greater intensity, never looking up. Quite often the bully is convinced they’re speaking FOR the room. Watch for it the next time you encounter it. The bully will likely even use language to back up that claim. “I know others feel this way,” or “I’m only saying what I others are afraid to say.” There are many other variations of it, but it’s all the same – “I’m speaking a universal truth for the entire team.” But there was never an election or an appointment. Like a military dictator, the bully just takes the power and drains all the communication energy out of the room squashing all other opinions, especially dissenting opinions. If the boss is the bully, you’re stuck. I would NEVER advise doing battle with the boss. You can influence the boss – maybe – but that’s a topic for another day. Don’t openly argue with your bully boss. Not all bosses are bullies, so I’m only talking about the ones who are! If you are the boss and somebody else is hijacking the communication in bully fashion, you have to stop it. It could be something as simple as, “I’d like to hear from some others before I hear from you.” Different leaders have different styles. If you’re a leader handle the way you’d like, but I encourage you to pre-think it. 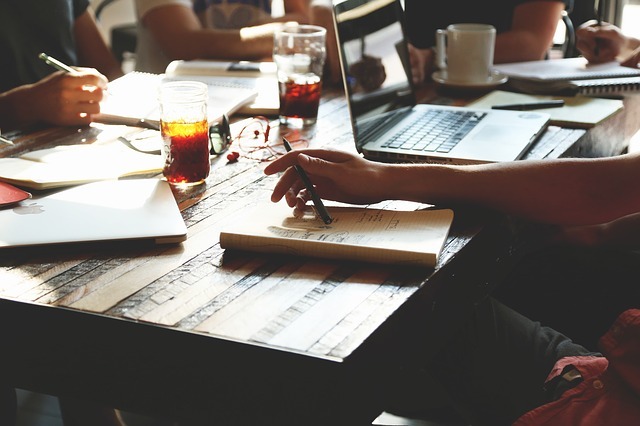 Be prepared to kick bad behavior to the curb when you get your team together. Getting input or feedback can be tough. The honest truth is, some people just don’t have a strong opinion. I used to think people were afraid or intimidated. And some are, or can be. But through the years I’ve come to realize there are far more people than I first thought who simply don’t care one way or the other. I’m not saying they’re apathetic. They just don’t feel strongly enough to speak up about every issue. Other people are in that same camp until they hear something they strongly agree with…or something they strongly disagree with. Then, they’ll speak up. But if that never happens, they might sit there never uttering a word. Giving people a safe, comfortable environment is important if the group is meeting to brain storm or figure out a solution. It’s impossible to address all the nuances of group think because groups get together for a variety of reasons. Interaction depends on the purpose of the meeting. Think about the context and purpose of the group so you can adjust the communication temperature of the room accordingly. Sometimes the temperature needs to be warm and comfortable. Other times it needs to be cooler. Leaders have to know the difference. Inexactness runs rampant in many organizations. Whether it’s the proverbial beating around the bush, or mincing words or soft-pedaling. But lessening the bluntness of communication is not the same thing as ambiguity, even though it can lead to it. You’ve experienced it before. Somebody is trying to tell you something, but they’re meandering, failing to just come out and say what needs to be said. You’re left wondering, “What were they trying to say?” If it was your boss, you were left feeling like a lost participant on Jeopardy, wondering what the question was. That makes finding the answer all but impossible. 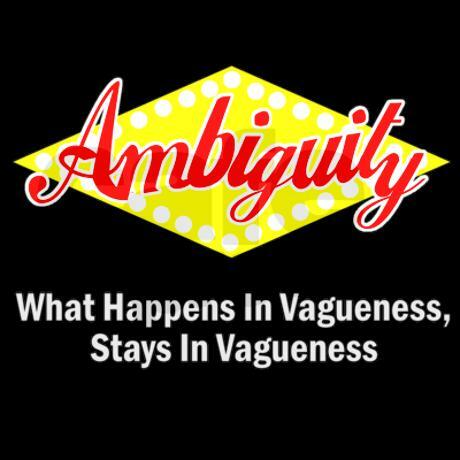 There’s one fundamental reason why ambiguity foils leadership. It distracts people. They spend more time trying to figure out what the leader was saying, or what they really meant than they do making a positive difference. And it’s entirely the leader’s fault. Consider a typical superstar employee who has an innocent casual encounter with the boss. The boss says, “Are you okay with the new software upgrade in the finance department?” The employee says, “Yes, sir.” The boss replies, “Okay, I was just wondering.” They go their separate ways. All afternoon the superstar employee is consumed with, “I wonder what he meant by that? I wonder if he knows something I don’t. I wonder if he thinks the upgrade is a bad idea.” Because the superstar employee is conscientious, he frets about what the boss said. It was ambiguous and the employee is left trying to connect dots. The boss doesn’t quite have it right though. And in true “the emperor has no clothes” fashion, the superstar employee was in a no-win-situation. He was trying to read the boss and be honest at the same time. Do you dare tell the boss you’re unhappy about a software upgrade that’s over half done? And what if the superstar is genuinely pleased about the upgrade? How was the employee supposed to respond? He’s asking himself all those questions and more. And the boss is characterizing the brief encounter completely differently. He heard the superstar employee say he felt good about the software upgrade, but that’s not what the employee said. He was asked if he was “okay” with the upgrade. He said he was. Seems like a trick question. Welcome to the world of the ambiguous leader. Now, the lieutenant has certain feelings about the superstar employee he didn’t have earlier. This was a star employee, but now there are doubts. Turns out the executives are having trouble with some points of the contract with the software upgrade. The superstar employee has no knowledge of those. He only knows the execution of the upgrade. During the proposal process, the superstar employee had some reservations, but he’s not a decision maker. He merely had expressed those concerns to his manager who assured him the executive team was going to address those things. And they did. Now, with about 45 days left before the upgrade is complete, things are on schedule and the superstar employee, being a faithful worker, is pushing hard to keep the timetable on track. How is leadership foiled? Because they’ve got a superstar employee in a bad spot. And they now feel differently about this worker. Everybody suffers. Scenarios like this play out all the time in the workplace where straight talk isn’t valued, or thought about. Sometimes it’s intentional game playing. Sometimes it unintentional and thoughtless talk, or questions. It results in ambiguity, which fosters distraction, confusion and bewilderment. Do YOU do your best work when you’re feeling like that? I wonder how many hours are spent each week amongst co-workers asking, “I wonder what he meant by that?” Think of the wasted hours spent trying to figure out the ambiguity. Then, drive yourself crazy thinking of saving all that time with clear, straight talk. It was a few years ago when I first read the phrase that served as a blog post title to an entertaining article, What Happens In Vagueness Stays In Vagueness. It was written by Clark Whelton, a speechwriter for New York City mayors Ed Koch and Rudy Giuliani, and appeared in City Journal, an urban policy magazine. I’m a sucker for all things communication so it hit my Google alert for some reason. I catch myself re-reading it every now again because it makes me smile and reminds of Edwin Newman, the old NBC newsman with a love of the English language (as evidenced by his appearance on Saturday Night Live). I agree with Mr. Whelton. Straight talk is one prescription – I’d argue a necessary prescription – for the organizational craziness that vexes many leaders and employees. Unfortunately, some confuse this with crassness, but that’s a cop out taken mostly by people who are…well, crass. Rude, crass behavior isn’t professional or effective in building a high performance organization. So I’m not giving permission or approval for boorish behavior. The third leg of my business offering (what I call the trifecta of business building) is to help people avoid going crazy as they build their business or organization. Slippery, unclear communication ranks high as a source for craziness among employees. “Why won’t he just tell me what he wants me to do?” is a common question I hear. “When you first assigned chores did you give them any instructions or did you just leave them to figure it out?” I asked. He stammered a bit trying to figure out what he had actually done. One son, the oldest, was responsible for the family pet, an outside dog. “Did you have to show him how to put food out for the dog, and water…or did you just let him put out as much food as he wanted?” I asked. He proceeded to tell me how he had to make sure his son measured out the food using a scoop inside the big bag of dog food, and how he had to tell his son to do it at a specific time each day. He also had to show him how to harness the dog for a walk (even though his son wasn’t the only one responsible for that). “But you had to train your son in those activities. You didn’t just wait for him to figure it out ’cause you wanted the dog to be properly taken care of,” I said. I asked if his son did the job with the dog perfectly the first time. Of course not. He told he repeatedly had to show his son and sometimes he had to bark at his son (so the dog wouldn’t bark for food). I asked him if a day came when his son did the job without being told, and did it well enough to suit him. Yes. Dad saw it happen. “Do you have to show him how to do that now?” I asked. “No, he just does it now,” he replied. This was an owner who had no written procedures though. So it was a hard lesson to learn. Over time we helped him realize that he had been taught many things by people who cared enough about him to help him do a good job. He had people in his life who didn’t just leave him alone hoping he’d figure it all out on his own. I simply helped remind him of his purpose as a leader – to serve the people doing the work so they could do their work better! The cowardly leaders avoid the hard work of serving their people because it’s not always easy. Sometimes it’s difficult, uncomfortable and too straight forward. Some leaders want to avoid the tension so necessary to serve their people. Like a parent who is too timid to discipline a child, the leader will quickly find themselves with employees who operate outside the lines. Show me a kid who’s a hellion and I’ll show you a parent unable to lead, or serve their child well. You can be a straight-talking leader known for serving your people…or you can be known as anything else, but that.